Back from the Thanksgiving mini break, where I had a delicious and wonderful Thanksgiving with the fam as well as a little staycation at The Beverly Hills Hotel. The weather was truly perfect with temperatures around 80! Hence a lot of poolside lounging, catching up on some reading with some eating and drinking thrown in. The Beverly Hills Hotel is wonderfully iconic and feels as though you have walked into an old Hollywood movie set from the 50's. From the palm leaf-print wallpaper lined walls. the Polo Lounge famous for their chocolate souffle (a must!) and the black and white framed photographs of movie stars framed throughout the hotel, there is certainly no shortage of pink and green! I felt as though I was Faye Dunaway lounging in a bathrobe poolside with my stack of books, magazines, and a Sunday Edition of the NY Times (did you see the article about Baby Fiona at the Cincinatti Zoo?) I just finished Ann Patchett's Commonwealth which I enjoyed and recommend and I am onto Sweet Bitter by Stephanie Danler. 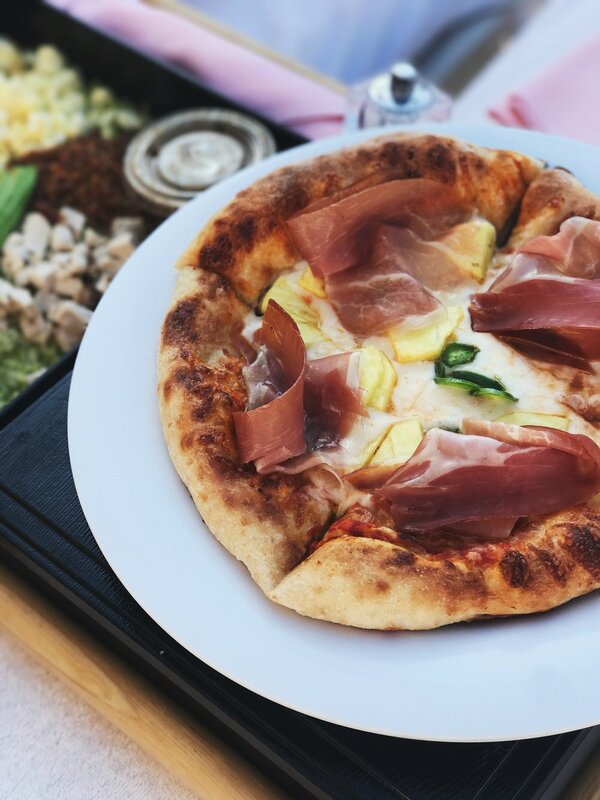 One must order a McCarthy Salad, originally put on the menu by the BHH in 1948 But a new discovery was the Pineapple Jalapeno Prosciutto Pizza! It was unreal. Now that Thanksgiving is past, it is sleigh ride into the Holidays! Gift Guides are up next!